Grab a lounger and plow through chapter after chapter while the kids splash around. Sit and soak as long as you like. You earned it out there today. Go with your favorite board game or get creative with charades or a rap battle. Remember what "real" breakfast tastes like? Rediscover what you've been missing. Team up and have a designated taste tester determine the winners. Skipping the slopes doesn't have to mean ditching the workout - hit the fitness center instead. It's a 4-minute shuttle ride to the Steamboat gondola. Hurry, the slopes await. The spectacular mountain views at the resort provide the perfect backdrop for your romantic getaway. Escape the cold and relax in any of the three outdoor hot tubs. Grab your camera and hit the trails. Emerald Mountain is 10 minutes drive from the resort. Work on perfecting your swing at Rollingstone Ranch Golf Course, 4 minutes drive away. 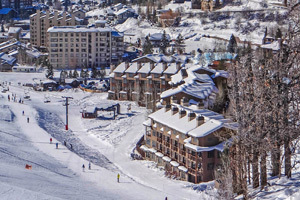 With a super-fancy private gondola to the ski area, the posh Trailhead Lodge is tucked into Wildhorse Meadows, Steamboat’s only master-planned community. Step out at the base of the mountain, sunglasses on, celeb-style and walk just steps to the gondola (or your private lesson, if you’re going all-out). Whether you’re a lightweight and ready to call it quits after just a few hours, or seriously hard-core, taking the last chair up to the highest point for the longest run down – either way, it’ll feel good to get back home to Trailhead. Ditch your boots in the deluxe drying room, stash your gear and gather in your condo for creative après ski drinks and a cheese plate. Then, quick, get changed for the outdoor hot tubs. Not ready to lose those ski layers just yet? Pull up a chair by the fire pit while the kids splash around. When everyone’s ready to head back inside, open the complimentary bottle of wine and vote on dinner in or out. There’s a free shuttle into town – just line up a table and go. Ragnar’s sleigh ride dinner is a Steamboat tradition. Tuck everyone in under the blankets and take a snowcat-driven ride to a five-course Scandinavian-inspired mid-mountain dinner. Or ride the horse-drawn sleighs at Haymaker or Saddleback Ranch. Early birds? Catch the resort’s private gondola in time to board the main gondola between 8:00 and 8:15 for First Tracks (intermediate and advanced only). You’ll have special crowd-free access to runs off the Sundown Express, Sunshine and South Peak lifts, plus the famous Priest Creek area. Historic downtown Steamboat is a can’t-miss. Make a day of it, with snow tubing at Howelson Hill and a few hours at the Old Town Hot Springs (waterslides!). HOUSEKEEPING Housekeeping Is Provided Once Per Stay. - Front desk is open 8:00 AM-5:00 PM daily. Guests that are planning to arrive after hours can pick up keys from a lockbox located outside the front desk. For more details please contact the property using information on the booking confirmation. With 2,965 skiable acres, 350 inches of annual snowfall and 165 trails to explore, Steamboat is a genuine winter wonderland. Marvel at Mount Werner as you ride a gondola uphill. Once at the peak, you can take off for a powdery downhill run or eat at one of the mountaintop restaurants.